Using a batter dispenser or a measuring cup, fill each of the cups about two-thirds of the way up. Bake for 20-25 minutes depending on your oven. The cupcakes are done when a toothpick comes out clean. Don’t forget to let the cupcakes cool completely before frosting your cupcakes. In a stand mixer (or a bowl with a hand mixer), cream the butter, vanilla and milk. Then add the powdered sugar until the desired consistency and sweetness is reached (about 3-4 cups). Using a food processor, process the Oreos until they are finely crushed. 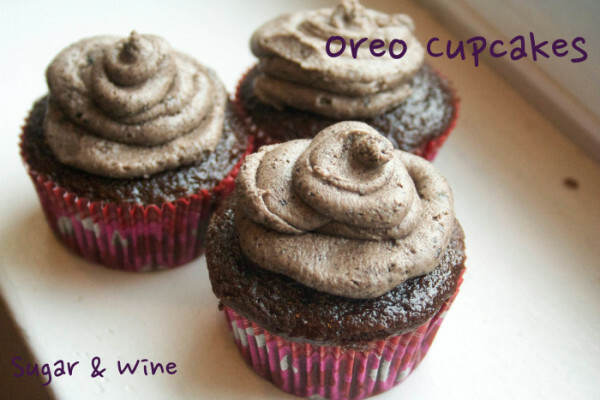 Mix in the crushed Oreos until combined. If you don’t like a lot of buttercream, you can always halve the recipe. I like a thick buttercream, like you can get from a bakery so I need a lot of icing.